-Help your child reach their highest potential and happiness. approaches that respect and empower your child. -Meet the world's leading educational experts in-person. WHY: To introduce parents and students to respectful schools and academies. ADMISSION: $50 (buy online or pay cash at the door). Limited tickets available. Get your tickets today. Discounts available for couples/groups. Kenneth Danford - "The Liberated Learners Network: Spreading the North Star Model"
Jill Pillot - "For Innovative Fashionistas: Follow Your Passion with an Apprenticeship"
Wes Beach - "Self-Directed Learning & Meaning"
His 1500 students have grown into successful and happy adults with amazing life stories of respectful learning. Luke Rudkowski - "How Students Can Become Influential Journalists"
www.WeAreChange.org, New York City, NY. Rahman Jamaal MC - "Learning Thru Rap: How to Make the Most of Your Words"
Dale Brown - "Survival Scouts: Preventive Threat Management for Students"
Matt Beaudreau - "Find a Calling. Change the World." Valerie Jaeger - "Deschooling: How Students & Parents Transition into Homeschooling"
Connie Giffin - "Holistic Education: Mother Nature & Unconditional Love in Action"
Dr. Paul Bulakowski - "Self-Directed Curriculum that Respects All Students"
David Rodriguez - "How to Find an Apprenticeship You Love"
﻿Limited seating available.﻿ Due to the high-demand for educational choices and the caliber of speakers and exhibitors, RESERVE YOUR SEAT TODAY TO EMPOWER YOUR CHILD! See our YouTube channel "Education Options TV"
What is the purpose of the Education Options Expo? The purpose of the Education Options Expo is to empower parents by introducing them to learning options that respect the needs of their children and maximizes their potential, self-motivation, self-reliance, and self-knowledge; ultimately, aiming for peace of mind that results from self-satisfaction knowing they made the effort to become the best which they are capable. What is the Education Options Expo? 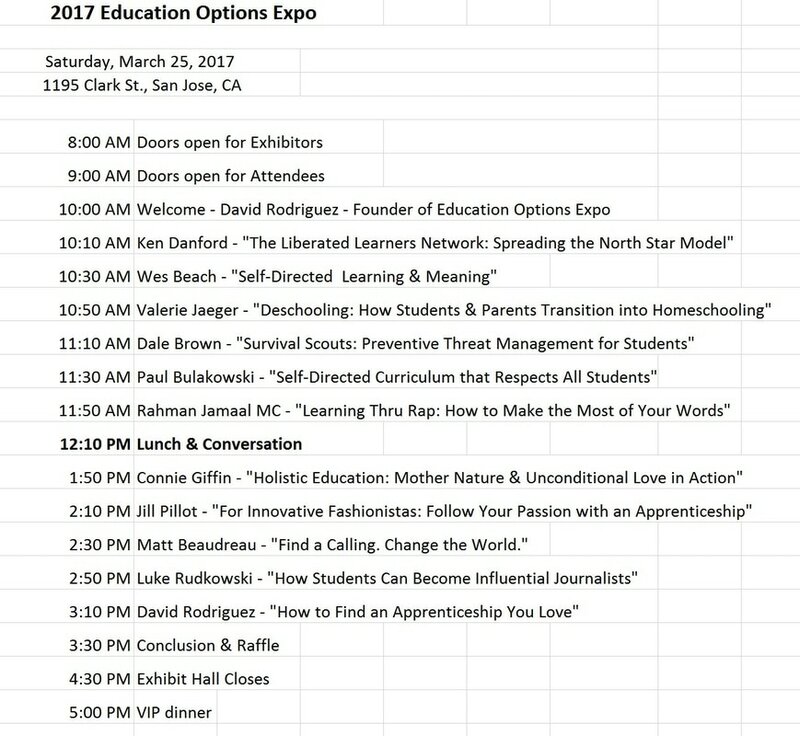 The Education Options Expo is an educational forum where parents of PreK12 students meet world leaders in education and empowered learning. The presentations will cover hot topics like: self-directed learning centers, apprenticeships, holistic schools, journalism school, homeschooling, deschooling, democratic schools, hip-hop education, self-directed curricula, and threat prevention tactics. Also, you will meet other parents with children and similar questions that you have, which will be a great way to build positive friendships and playgroups benefiting your child's life in the short-term and long-term. The Respectful Learning Revolution has begun and will emphasize learner-centered learning, as opposed to outdated, mass schooling factory model which uses a "one size fits all" philosophy dating back to the 19th century. You are part of a large and very exciting movement. After all, 2015 is the fastest changing year in all of human history, and 2016 looks like it will move even quicker. If you are reading this, your child has a chance to lead their field in the coming years, regardless if they are aged 5, 10, or 15. Attendees of the Expo include: founders of schools, leaders of homeschooling groups, experienced teachers, authors, active community members and educational visionaries (innovators/entrepreneurs), local media, and parents. Exhibitors of the Expo include representatives of: private PreK12 schools, homeschooling, unschooling, and educational and media groups. Why was the Expo created? We started this event because the future is changing faster than ever before in history and your child deserves to excel in it. The way to ensure this happens it to empower them with an education that is up-to-date, respectful, and prepares them for the incredible changes which occur more rapidly with every day. Parents are demanding new and better methods of learning which tap into, and maximize, the potential of their child. So it's up to each individual and community around the Bay Area to take leadership and begin exploring real educational options. The Education Options Expo will introduce you to schools and educational models that are designed to accelerate in your child's learning and success journey. I'm excited. What do I do now? Lunch will be onsite by the tasty, and healthy, Street Fusion (http://www.yelp.com/biz/street-fusion-san-jose-2). "If you want wealth for a year, grow grain. If you want wealth for 10 years, grow trees. If you want wealth for 100 years, grow people."